The plot can be described fairly simply. It's the Lone Ranger's origin story. How could you muddle and confuse that? By opening the movie in 1930's with a young boy, dressed as the Lone Ranger, talking to a museum exhibit of a very old Tonto (supposedly a manikin or wax dummy that comes to life) who then goes on to relate the story of John Reid A.K.A. the Lone Ranger. A story set in 1869. Sure it says something about how kids have always been fascinated by the legend of the Lone Ranger (I certainly was growing up) but the film doesn't do anything with it. There's no great revelation in the 1930's about anything we've just seen at the end of the film. The story just ends. You could take that whole section out and not miss it at all. The only reason I can see for it is that it allows the story to jump around. I don't think it ever goes out of sequence but it does allow the film to fast forward past things that may have bogged the movie down. It also helps to explain a pretty magical white horse turning up in some pretty improbable situations and moments. For example, the horse just randomly shows up on top of a barn roof. The barn is on fire and has a two or three gunmen out side watching to shoot anyone that might come out. The obvious thing to do is climb to the barn roof where you're surprised to see your horse waiting to help make your getaway. Highly improbable but if you recall, you're watching a story that is being retold to a young, impressionable boy. Such an improbable situation as a horse turning up on the roof of a barn is likely to be the artistic embellishment of the story teller. Having said that, the weird white horse turning up in odd places is actually a highlight of the film that nearly upstages Johnny Depp's understated but still quirky Tonto. I can't really fault Depp's performance as Tonto, other than to say I was expecting a character a little more outrageous, more along the lines of Captain Jack Sparrow. Armie Hammer, on the other hand, did look the part of the Lone Ranger but the script he had to work with really didn't make him as likeable as he needed to be. He started off well, as a very straight down the line lawyer type who believes in the judicial process, however he never really veers too far from that ideal. By the end of the film John Reid is still John Reid the naive and somewhat annoying lawyer rather than a more weathered and experienced Lone Ranger. We never really get inside his head or get the urge to dig deeper into his psyche. It's a shame because I did think Armie was good with what he had to work with and his character should have been the focus of the film despite Depp being the bigger star. In contrast, just about everyone in Man of Steel was a bigger star than Henry Cavill but that film was still all about his character and he was on all the posters. Depp fans would have seen the Lone Ranger whether he was the focus of the marketing or not. Those were my main issues with the film. The way it was told meant there was quite a bit of time between each set action piece, which would have been fine, but the character moments didn't do enough to get you invested in any of them, other than Tonto. Things like John Reid waking up on top of an enormous wooden scaffolding, on top of an almost impossible to access peak, looked great in the trailer but was only onscreen momentarily in the film with no explanation. Not even how he got up there nor how he got down. A better edit of the film, minus all the story telling scenes by the older Tonto, could really lift this film in my opinion. It had all the elements to be a fast paced western with Indiana Jones type action and they bogged it down with unnecessary exposition that could have been replaced with scenes to help us relate more to the main character. 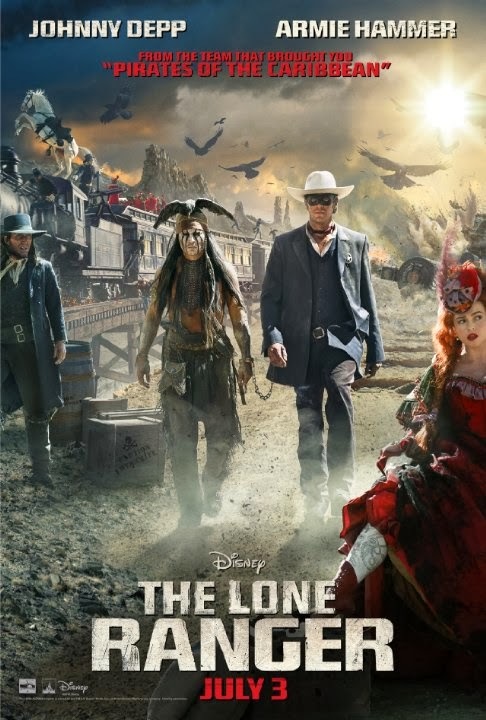 The Lone Ranger is certainly worth your time. It's definitely not as bad as you've been lead to believe. However it could have been so much better and definitely had more of a chance for multiple movies.